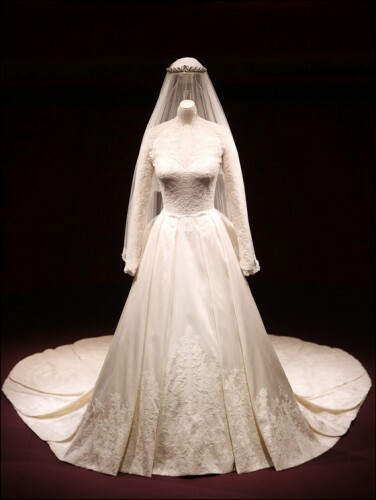 Cloaked in secrecy, the creation of Kate Middleton's wedding gown was an elaborate process. Sarah Burton, the creative director of Alexander McQueen, was chosen to design what would be an iconic and historic gown. The two women worked closely to come up with a dress that was both elaborate and streamlined. The lace of the dress was partially-handmade in complete secrecy at the Royal School of Needlework, at Hampton Court Palace. The Telegraph reported: "The workforce, which included embroidery students from not only the UK but also Japan, China, the US, Thailand and Germany, washed their hands every 30 minutes to keep the lace and threads pristine. The needles were renewed every three hours, to keep them sharp and clean...The lace design and process was influenced by traditional Carrickmacross lace which originated in Ireland in the 1820s." In another Telegraph Fashion special, the design was described: "Individual flowers have been hand-cut from lace and hand-engineered onto ivory silk tulle to create a unique and organic design, which incorporates the rose, thistle, daffodil and shamrock....Hand-cut English lace and French Chantilly lace has been used throughout the bodice and skirt, and has been used for the underskirt trim. With laces coming from different sources, much care was taken to ensure that each flower was the same colour."